Protopresbyter Alexander Schmemann: John Meyendorff, "A life worth living"
The thoughts and feelings expressed by those who had the opportunity to speak at Fr Alexander Schmemanns funeral services  hierarchs, colleagues and friends  reflect all that needs to be said in these first weeks after his untimely death on December 13, 1983. Others perhaps will eventually undertake a more thorough evaluation of his thought and writings, including that, which remains unpublished. My task here is only to point to the main periods of his life, without pretending to be exhaustive. As one writes about a very close friend  almost a brother  it is, however, impossible to be totally objective, to avoid being somewhat subjective and impressionistic in interpreting what was truly significant in Fr Alexanders life  a life truly worth living! For this subjectivity I apologize in advance. Born in 1921 into a Russian family, with Baltic German ancestors on his fathers side, Fr Alexander moved to France from Estonia in his early childhood. The life of the Russian emigration in Paris became his life until his departure for America in 1951. The "Russian Paris" of the 1930s was a world unto itself. Numbering tens of thousands and including intellectuals, artists, theologians, grand dukes and former tsarist ministers, publishing daily papers and settling political divisions in hot arguments, Russian émigrés still dreamt of a return home. Children were reared in Russian schools, somewhat in isolation from the surrounding French society (which actually was not always very hospitable to them). The young Alexander (or Sasha, as he was called by family and friends) tasted something of that secluded Russian education: he spent several years as a "cadet," in a Russian military school in Versailles, and then transferred to a gimnaziya (high school). Whatever the merits of that initial schooling, it hardly satisfied his mind and aspirations. Even then he felt that the best in the great legacy of Russian culture (particularly Russian literature) was not closed to the West, but was, on the contrary, necessarily "European" in scope. Dostoevskys famous "Pushkin speech" represented for him the only valid understanding of Russia and of Russian civilization. He refused to accept its artificial limitation, and pursued studies at a French lycée and the University of Paris. Already as a teenager, Alexander discovered his true spiritual home in the Church. His initiation to Orthodoxy and its authentic spirit took place not so much at the dull, compulsory religion classes given at the military school or the gimnaziya, but rather through active participation in the liturgy at the monumental St Alexander Nevsky Cathedral on rue Daru, as an altar boy and later as a subdeacon. 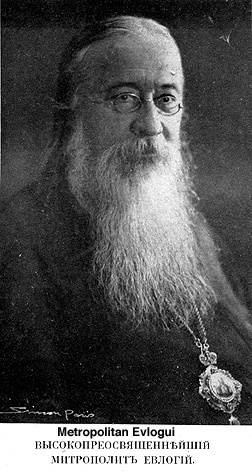 Inspired by the eminently wise and always gracious personality of Metropolitan Evlogui, by a clergy a little "old régime" but also enlightened and open, by the dedicated leadership of Dr Peter Kovalevsky (who headed the large staff of "minor" clergy at the cathedral), Alexander understood the value and dimensions of the liturgy and even developed a certain love for pomp and ceremony, which remained with him all his life. The years of World War II and the German occupation of France were years of decisive options. Providentially sheltered from the tragedies of war Alexander studied at the Theological Institute of Paris (1940-1945) and married Juliana Osorguine (1943), then a student in classics at the Sorbonne and a member of a traditional, church-oriented Russian family. It became quite clear in those years, to all his friends and acquaintances, that Alexander had found his true vocation, and also that God had blessed him with successful marriage and family life. The inspiration and joy that he found then contributed much to the power with which, in all later years, he was able to communicate their content to others. The Orthodox Theological Institute in Paris "St Sergius," as it is frequently called  had gathered a somewhat heterogeneous but remarkable faculty, which included representatives of the old theological establishment of pre-Revolutionary Russia (A.V. 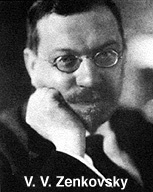 Kartashev), intellectuals who came to Orthodoxy during the revolution (V.V. Zenkovsky) and former students at Belgrade (Fr Cyprian Kern, Fr N. Afanassieff). The school was still dominated by the personality of Fr Sergius Bulgakov, a former Russian seminarian, then a Marxist philosopher and finally  through the influence of Vladimir Soloviev and Paul Florensky  a priest and a theologian. During the war years at St Sergius the students were few, but the enthusiasm and the hopes for an Orthodox revival remained strong. Never attracted by the "sophiological" speculations of Bulgakov  for whom, however, he had the greatest personal respect  Alexander Schmemann was primarily seeking specialization in church history. He became a pupil of A.V. Kartashev, whose brilliant lectures and skeptical mind matched Schmemanns own tendency to critical analysis of reality around him. The result was a "candidates thesis" (equivalent to an MDiv) on Byzantine theocracy. 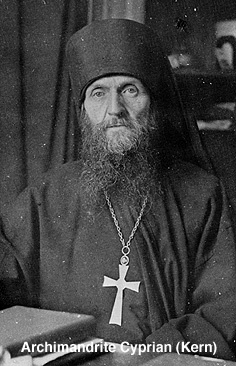 Having completed the five-year program of studies at St Sergius, Schmemann became an instructor in church history, first as a layman, then as a priest, following his ordination by the then Archbishop Vladimir (Tikhonitsky) in 1946, who was heading the Russian Exarchate of Western Europe under the jurisdiction of the Patriarchate of Constantinople. Besides A.V. 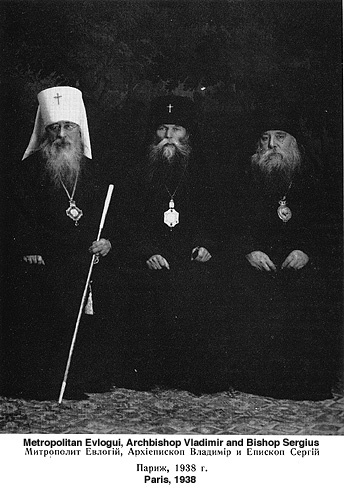 Kartashev, two other members of the St Sergius faculty exercised a decisive influence upon Fr Schmemann. 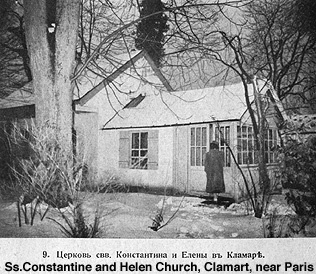 Archimandrite Cyprian (Kern), his spiritual father and friend, also took him as his assistant in the SS Constantine and Helen parish in Clamart, near Paris. Fr Cyprian taught Patristics at St Sergius, but his love was for the liturgy and his liturgical taste had a lasting influence on Fr Schmemann. Both also shared knowledge and appreciation of Russian classical literature. 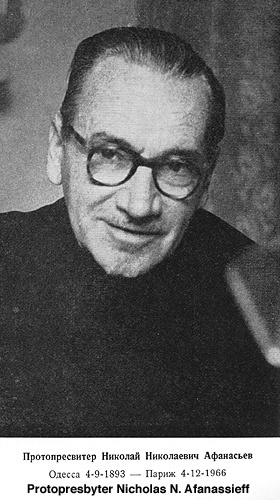 Intellectually more decisive, however, was Fr Schmemanns acquaintance with and devotion to the ecclesiological ideas of Fr Nicholas Afanassieff, a professor of canon law whose name will be forever attached to what he called "eucharistic ecclesiology" and whose ideas are reflected in many of Fr Schmemanns writings. As a young instructor in Church History, Fr Schmemann planned to write a doctoral dissertation on the Council of Florence. He eventually abandoned that topic, but the publication of a short treatise by St Mark of Ephesus on "The Resurrection" remains from that initial interest in Byzantine studies. Actually, the Church itself always stood at the center of Fr Alexanders spiritual and intellectual interests and commitments. His discussion of Byzantine theocracy, and his readings in Church History in general  as well as his initial dissertation topic  come from his concern with the survival of the Church, as Church, during the centuries of an ambiguous alliance with the State, and the survival of Orthodoxy in its medieval confrontation with Rome. But, perhaps, he lacked the necessary patience for remaining concentrated on the Churchs past: the existential today was that which really mattered. And today, the Orthodox Church could not be alive either as a defence of the State, or cultural appendix of "Russianism": it was alive in and through the Liturgy. Here, the ecclesiology of Afanasieff provided the direction (although not really the model) for Fr Alexanders further orientation as a theologian. It is quite clear that Fr. Alexanders theological worldview was shaped during his Paris years. But, although the influence of some of his teachers at St. Sergius was decisive, he always lived in a wider spiritual world. The forties and fifties were a period of extraordinary theological revival in French Roman Catholicism  the years of a "return to the sources" and a "liturgical movement." It is from that existing milieu that Fr Schmemann really learned "liturgical theology," a "philosophy of time" and the true meaning of the "paschal mystery." The names and ideas of Jean Daniélou, Louis Bouyer, and several others are inseparable from the shaping of Fr Schmemanns mind. 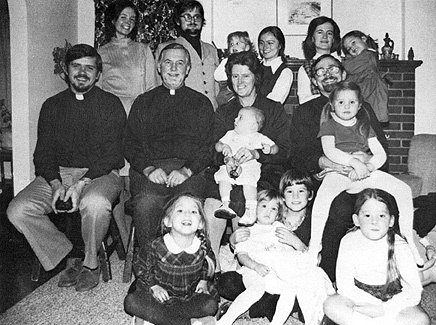 And if their legacy was somewhat lost within the turmoil of postconciliar Roman Catholicism, their ideas produced much fruit in the organically-liturgical and ecclesiologically-consistent world of Orthodoxy through the brilliant and always effective witness of Fr Schmemann. Orthodoxy in France was not made up only of intellectual or theological pursuits. The breakdown of all reasonable hopes for a swift return to Russia raised the immediate issue of a permanent survival of Orthodoxy in the West and involved the question: Why did an Orthodox "diaspora" occur at all? Together with most representatives of the "younger" generation of Orthodox theologians, Fr Schmemann saw no other answer and no other meaning for the existence of the "diaspora" than the establishment of a territorial, eventually French-speaking local Church in France. 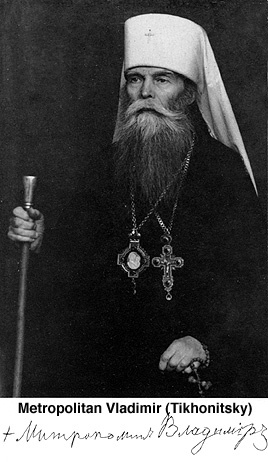 His opposition to a return to the jurisdiction of the Moscow patriarchate was primarily based on the hope that the ecumenical patriarchate, under whose protection the Russian "exarchate" of Western Europe had placed itself in 1931, would initiate and sponsor such a gradual Orthodox unification according to canonical norms. Most Russians, however  including the older generation of St Sergius professors  rather saw the Constantinopolitan allegiance negatively, as a shield against Moscows control  not as an opportunity for a mission to the West. Here lies one of the important elements which eventually encouraged Fr Alexander and his family to look to America for better conditions of realizing a more consistent Orthodox ecclesiology in the concrete life of the Church. The decisive factor which determined the departure of Fr Alexander for the United States, was the return to Paris from Eastern Europe of Fr Georges Florovsky, and his eventual appointment as Dean of St Vladimirs in New York. Fr Florovsky had taught at St Sergius before the war, but his relationships with his colleagues were not easy. This uneasiness was partly due to his criticism of the sophiology of Fr Bulgakov (a criticism which, however, appears only indirectly in his writings). Rescued from Soviet-occupied Czechoslovakia in 1947, through the mediation of ecumenical friends, Fr Florovsky could not reassume his chair of Patristics at St Sergius (it was now occupied by Fr Cyprian Kern). He taught Moral Theology for a short while and then accepted the post at St Vladimirs in New York (1949). Fr Schmemann became fascinated by the brightness of Florovskys theological mind, by his vision of the Orthodox mission to the West, by his criticism of accepted nationalistic stereotypes, by the fact that he succeeded in being both rooted in the Churchs past and fully open to the best theological movements of Western Christendom. 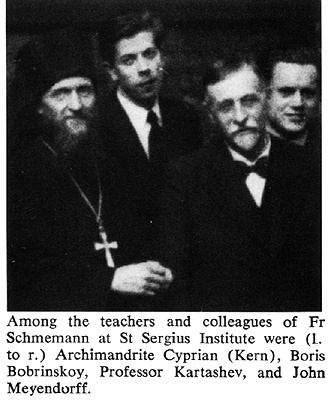 The fact that Fr Schmemann left for America (1951) and joined the faculty of St Vladimirs then being built up by Fr Florovsky, was felt at St Sergius as something of a betrayal, especially since it was eventually followed by similar moves by S. S. Verhovskoy (1953) and, later, by John Meyendorff (1959). 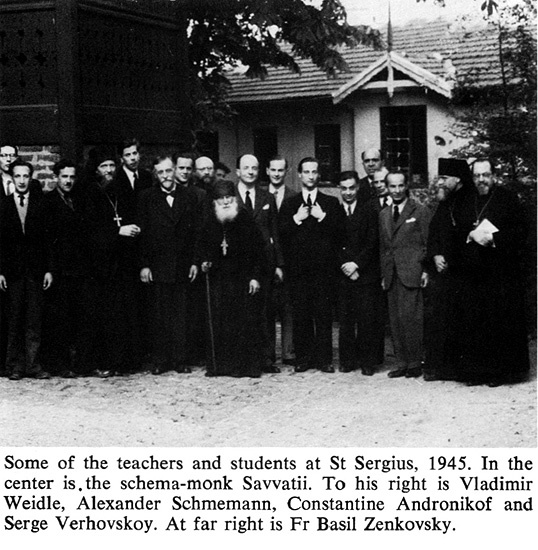 The subsequent history and development of Orthodoxy in America does appear to show that the moves were justified, especially since St Sergius itself, although deprived of some of its faculty, not only survived, but eventually turned its programs and orientation in the Pan-Orthodox direction, which made survival possible. The early fifties were not easy years for St Vladimirs Seminary, then located in the extremely modest quarters of Reed House, on Broadway and 121st Street. Conflicts of temperament and style are at the bottom of the regrettable resignation of Fr Florovsky (1955), who by the mere prestige of his personality had placed St Vladimirs on the academic and theological map of the country. Only in 1962, when the Seminary acquired its present campus in Crestwood, N.Y. did Fr Alexander assume the post of Dean, which he held until his death in 1983. It is probably too early to speak in detail of the last and longest period of his life in America, associated with the Seminary and with the Church at large. Perhaps the single most obvious contribution of Fr Alexander to the life of St Vladimirs was that he succeeded in integrating the school within the very texture of ecclesiastical life. During his tenure, it ceased to be simply an academic institution, respected in ecumenical circles, but rather heterogeneous to the life of dioceses and parishes. St Vladimirs produced priests, and these priests, serving not only within the "Russian Metropolia," but also in other jurisdictions (particularly the Antiochian and the Serbian) were taught the spirit of a universal and missionary Orthodox Church, transcending purely ethnic concerns. Also, St Vladimirs became the center of a liturgical and eucharistic revival, which is recognized and praised by both Metropolitan Theodosius and Metropolitan Philip in their homilies published in this issue. Fully committed to his work in America, Fr Schmemann did not break links with Europe. It is there at his alma mater of St Sergius that he obtained his doctorate in 1959, with Fr Nicholas Afanassieff and the present writer acting as examiners. A real watershed in Fr Alexanders career in America was the establishment of the autocephalous Orthodox Church in America in 1970. If there was any commitment which was constant in his life, already in France, it was the hope that the uncanonical overlapping of "jurisdictions," which was the single most obvious obstacle to Orthodox witness in the West, would be replaced by local Church unity in conformity not only with canons, but with the most essential requirements of Orthodox ecclesiology. Fr Alexander  and those of us who were committed in the same fundamental aspirations  hoped that the ecumenical patriarchate of Constantinople would contribute to (and possibly lead) Orthodox unity in America, for example through the "Standing Conference of Orthodox Bishops." But a role for Constantinople in such a process of unification would have required the consent of all the other Orthodox Churches including the patriarchate of Moscow, whose jurisdiction in America was never denied by the Metropolia and was always sustained by American civil courts. On the other hand, Constantinople, very demanding in theory, was in practice quite inconsistent (it terminated its jurisdiction over the Russian diocese of France and called it to return to the patriarchate of Moscow in 1965). The other churches would clearly not even envisage transferring their "diasporas" to the Greek patriarch. Realistically, the basis for Orthodox unity was rather to be found in the policies which the Russian Church always followed in principle, since it first established Orthodoxy in North America. Its canonical and missionary aim had always been a Church for Americans, established with the blessing of the Mother Churches and inviting all those who were interested freely to join in. This last offer implied, of course, that unity could not be established unilaterally, that the free consent of all was required. Of course, the patriarchate of Constantinople was still welcome to assume leadership in an eventual unification process. 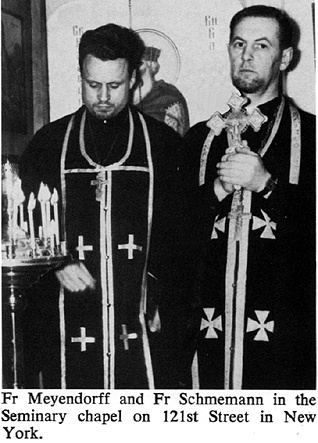 During the negotiations leading to autocephaly, a remarkable personal link was established between Fr Alexander and Metropolitan Nikodim (Rotov) of Leningrad, whose full understanding of the historical opportunity for Orthodoxy in America and single-handed effectiveness in realizing the common goal, made possible the signing of the Tomos of Autocephaly on April 10, 1970 by Patriarch Alexis of Moscow. This act, however, was understood both by the Mother Church of Russia and its daughter-church in America, as the first  and not the last  step towards Orthodox unity to be realized through conciliar assent of all Orthodox Churches. In the midst of his work as teacher and his involvement in the life of the Church  with lectures, articles, addresses and meetings all over the country  Fr Schmemann never lost another concern which he held since his youth: the fate of Orthodoxy in Russia. The opportunity he had for years to address a weekly sermon in Russian on "Radio Liberty" made his name known to many among the ghettoized and repressed Christians in Russia. One of them was Alexander I. Solzhenitsyn, whose writings, smuggled abroad, were for Fr Alexander  as for many others  a breath of fresh air from the depressing flatness of Soviet reality, a witness to the spirit of "true" Russia and an authentic miracle of spiritual survival. About Solzhenitsyns attitude to Russia, Fr Alexander coined a great word: the author of the "Gulag Archipelago" and of "August 14" had a "seeing" or "lucid" love of Russia, as opposed to the "blind" nationalism of so many. Fr Schmemann was particularly indignant at those  Russian and Western  critics of Solzhenitsyn, who saw in him precisely that "blind" nationalism, which the criticism of pre-Revolutionary Russia in "August 14" refutes so obviously. However, Fr Schmemann also responded negatively to some of Solzhenitsyns enthusiasms, for instance his (passing) admiration for the Old Believers. Be it as it may, it seems to me that if there is a talent which Fr Alexander did not have the time to develop fully in his published writings, it is his extraordinary grasp of Russian literature (and Western, particularly French), his ability to discern what was "true" and what was "false." His few writings (and lectures) on literary topics were among the best in his entire legacy. 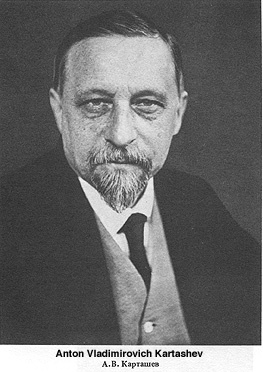 A full biography could mention other aspects of Fr Schmemanns career: his involvement, still in France, as Vice-Chairman of the Youth Department of the World Council of Churches, and his brief passage in the "Faith and Order Commission," his lecturing as Adjunct-Professor at Union, at General and at Columbia; his later involvement with more conservative Christian circles (the "Hartford Appeal"). A great master of the spoken word, a man able, better than anyone, to relate and to sympathize authentically, but first and foremost a priest committed to the Church always seen, in spite of all human deficiencies, as an anticipation of the Kingdom and as the only authentic token of immortality, Fr Alexander Schmemann occupied so great a place in the life of so many! His legacy will not disappear, not only because his friends will not forget him, but because he obviously remains in the Eternal Memory of God, as a faithful servant in this vineyard. St. Vladimirs Theological Quarterly, Vol. 28, No. 1, 1984, pp. 3-10.